It’s a happy new year at the Toronto Zoo, which welcomed its first newborn animal of 2018 back on Jan. 4. 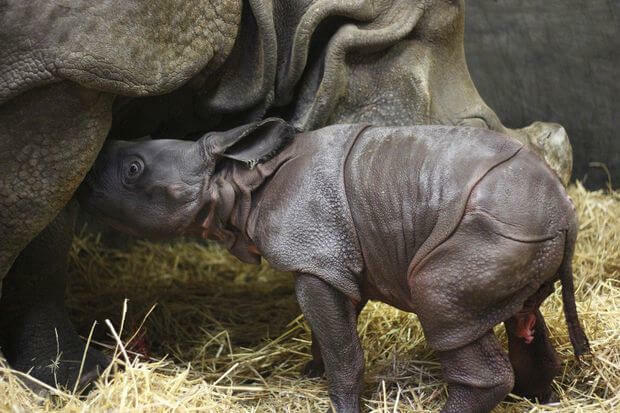 A greater one-horned rhinoceros calf joined the herd of more than 5,000 animals that call the premier Canadian zoo home. 13-year-old rhino Ashakiran gave birth to a male calf following a 16-month pregnancy. The calf, whose name has not been released, is the fifth greater one-horned rhino born in the zoo’s history. Ashakiran gave birth to another calf in February 2016, while a white rhino was born at the zoo last December. Greater one-horned rhinos, also known as Indian rhinos, nearly went extinct in the early 1900s as they were hunted for sport or killed as pests. Thanks to conservation and protection efforts, their numbers have increased, but habitat degradation and poaching are still very real threats. There are about 3,500 of these rhinos left in the wild, where they live in northeastern India and the Terai grasslands of Nepal. Greater One-Horned Rhino Calf Taking A Splash! Zoo staff also wrote about the calf learning from his mother on Jan. 15, at 11 days old. Zookeepers anticipate the energetic calf will begin to eat leaves within a few weeks. While he is not yet on display, his zoo adventures are documented online as part of the Baby Rhino Diaries.